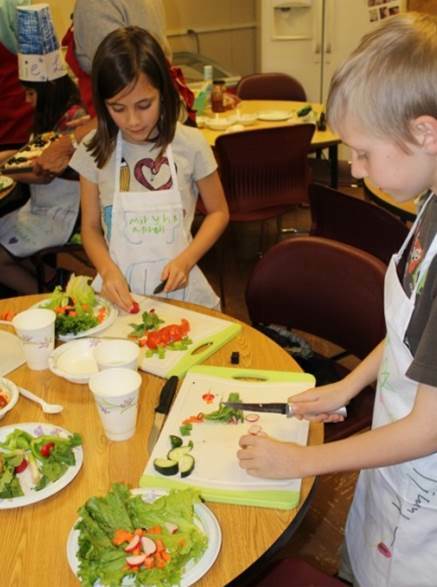 Four-week cooking class are offered to low-income 4th and 5th graders in some of the Title I-A schools in Deschutes County. The classes are held after school and are taught by qualified Assistance League members and community volunteers. Students are taught basic cooking and knife skills, weights and measures, nutrition, how to read labels, manners, how to set a table, and other valuable information that they might not receive at home. Over the course of the program, students prepare a breakfast, a lunch, healthy snacks and a dinner. Each student takes home a cookbook. The three-hour sessions have been offered at many elementary schools.